Jürgen Habermas: our European Hegel? What is left out in Habermas’s deliberations on Europe is any possibility for political, social or cultural contingencies; the assumption is that things simply get better if not all but then at least most of the time. It has by no means always been clear that Habermas’s European argument would develop into the critical theorist’s secular equivalent of a full-blown modern version of Hegel’s world spirit. It is one thing to see Europe as a collective representation that could, at least potentially, act as a political agent and representative and serve as a major platform and player in a newly globalised world (whatever other contradictions this might cause); it is quite another to pretend that there is an inherent tendency at work that leads to the formation of larger unities and even anticipates a world society including forms of hitherto unknown global governance. 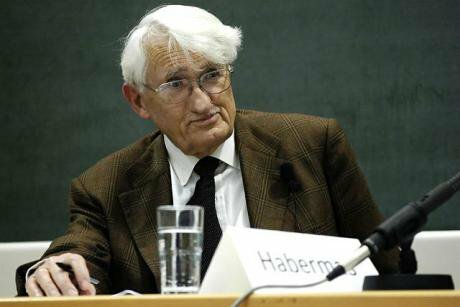 (For Habermas this process is mainly spearheaded by and expressed in the form of modern international law. The argument is not new. It appears already in his Faktizität und Geltung (engl. transl Between Facts and Norms) but is pushed to contingency levels in Zur Verfassung Europas. A cursory reading and juxtaposition of Ach, Europa with a later essay published as Zur Verfassung Europas (Habermas 2011) helps to identify some of the differences. It is not by chance that one of the texts in the first Europe collection is dedicated to Richard Rorty. In his appraisal Habermas praised Rorty’s general awareness of contingencies, including his stress on political contingencies and his prioritizing of politics over philosophy. Habermas pointed out that according to Rorty, any critique of Plato must result in a philosophy that is aware of its own historical kernel. According to his appraiser, Rorty has taken up Hegel’s insight that philosophy must be regarded as an exercise that attempts to contain and express its time in thought seriously. However, Habermas also stressed that Rorty understood that maxim in a very a different way from, for example, Heidegger (Habermas 2008, 33ff). In contrast to the self-celebratory turn of Germany’s existential philosopher, Rorty understood the public task of philosophers as one directed against metaphysics and scientism but also as one that criticised many liberals for having given up attempting to appeal to the wider citizenry by using philosophical tools and insights. For Habermas, Rorty excelled in this task by grasping and explaining contingencies by referring to irony or ironic constellations. What proved especially attractive in this context was Rorty’s self-awareness when speaking as an American about America. As Habermas rightly pointed out, he knew that for a superpower cosmopolitanism connoted something very different from just the export of one’s own lifestyle (38).